I booked a Saturday morning appointment with Christina, one of the owners. A native Houstonian, she’s been doing nails for a few years, but also, her parents own a nail salon in Pearland, so she’s familiar with the biz. Currently, they have five nail techs with an additional one coming on soon. Dripped has been open about three weeks, accepting both appointments and walk-ins. Located on Westheimer just off Montrose, the salon is housed in a space formerly occupied by the Spy Emporium. The ladies of Dripped gutted the space to start fresh. 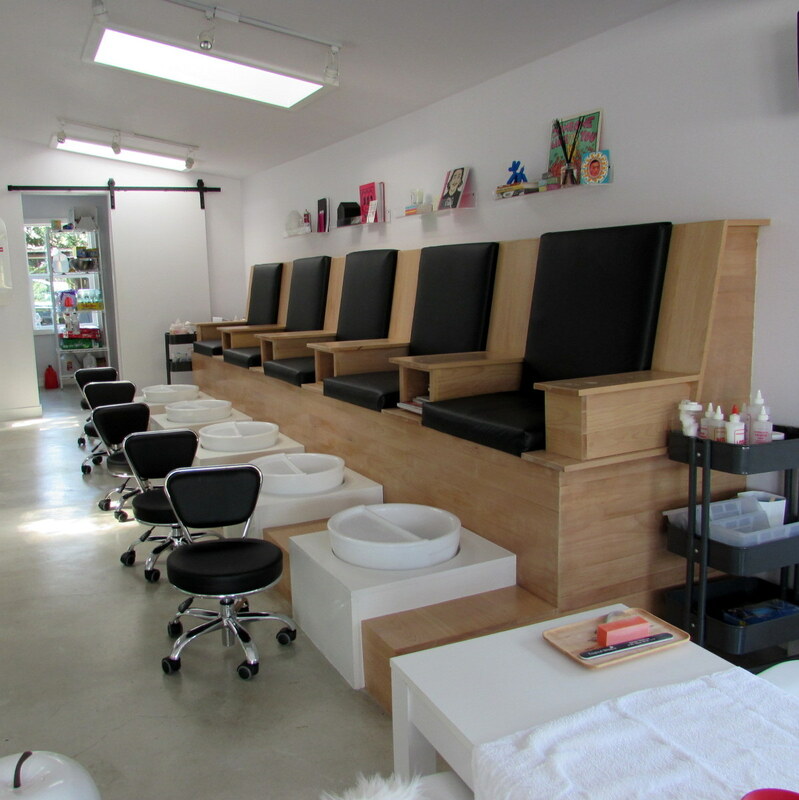 The salon has a clean look with white interior and decor and a sleek bank of custom-built pedicure stations. Since I typically do my own nails, I was a little lost on how to get started. Christina guided me through the process. I knew I wanted some nail art and that I prefer geometric designs. I said no to studs or charms, figuring I’d have a hard time maintaining them. And I knew I had a budget of how much I wanted to spend. First, Christina removed my existing red polish and prepped my nails — filing, cuticle care, buffing. Gel formulas cure with either a UV or LED light, and once the gel polish cures, it’s completely dry. It’s a beautiful thing to walk out of a salon and not worry about messing up your new manicure. Once the base color was applied, Christina worked on the designs. First, she painted the dusty pink half moons on the tips of every other nail. Next, came the more intricate stripe designs. She painstakingly painted cross and grid patterns on the four remaining nails. Once all the color polish was painted, she applied a top coat, and I did a final curing under the LED light. Do you know one of the secrets to making your manicure last? Apply cuticle oil daily. (SIDE NOTE: Before I go to sleep every night, I massage in Essie apricot cuticle oil followed by L’Occitane shea butter hand cream.) Properly maintained, a gel manicure can last up to 14 days. Christina applied the cuticle oil after the final light curing, then hand lotion, and wrapped my hands in warm, damp towels. I then received a quick neck and shoulder massage. Towels off, and I was ready to go. Dripped Nails is a fresh concept on the traditional nail salon. With a super location in town and fair prices (a straight gel manicure is $40), you should book your next mani-pedi at Dripped. And don’t be afraid to step up your manicure game with some fun nail art. This is the place to do it.